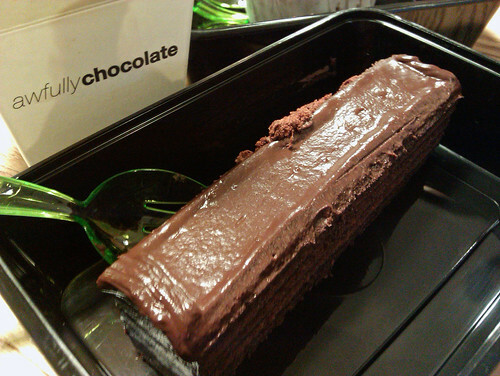 Awfully Chocolate (AC) is like an open secret amongst chocolate lovers. 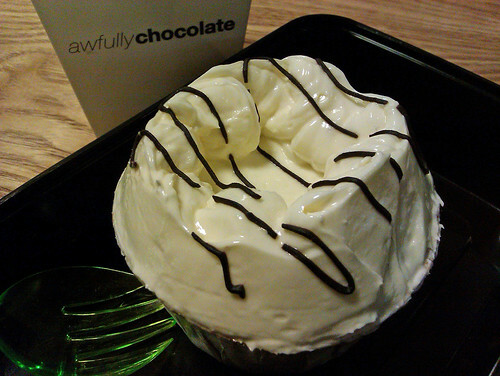 Originally at Katong Mall, the small and minimalistically furbished shop attracts cocoa fanatics from all over the island to pig try out their irresistibly yummilicious chocolate cakes and ice-cream. Since the mall was pulled down, AC relocated just diagonally across the road and became neighours with Obolo, Ashtons and one of my all-time favorites, Puteri Mas Durian Puffs! Since then, a frantic franchising movement seems to be going on with outlets springing up all over the island (well, almost all over :p). Being curious us, we would naturally join a queue when we see one. So that was what we did at the new AC joint along East Coast Road. White Chocolate cupcake. The creamy icing topping is whipped up on the spot with a handsome stand mixer behind the counter. We watched them prepare this, liberally downing copious amounts of sugar! The taste is merely sweet without much depth and reminds of the melamine-containing White Rabbit Creamy Candy, 大白兔奶糖. Not a very pleasant memory. 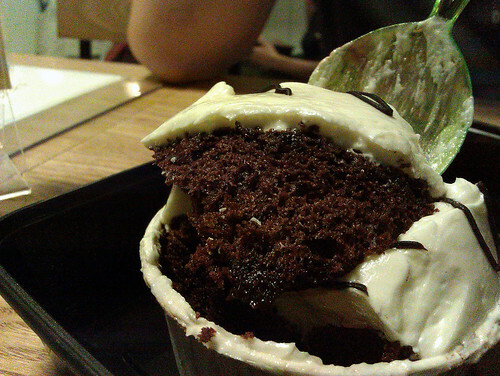 Revealing the chocolaty insides of the White Chocolate cupcake, quite moist and spongy. 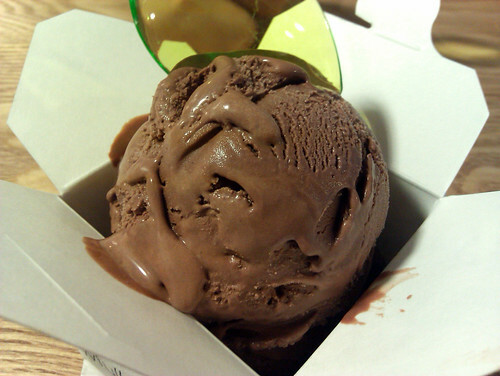 Their chocolate gelato “Hei 黑” is simply to die for, The texture was smooth and velvety but not overpoweringly dark like the ones from Gusttimo. Its is potent stuff! Not for the faint heart! Potentially addictive! You have been warned…. Super Stacked Chocolate Cake. Well… a bit of mixed feelings about this. It was sensational with a lot of “oomph” on the first bite but unlike the Hei gelato, failed to leave an everlasting impression. Quite ironic eh? 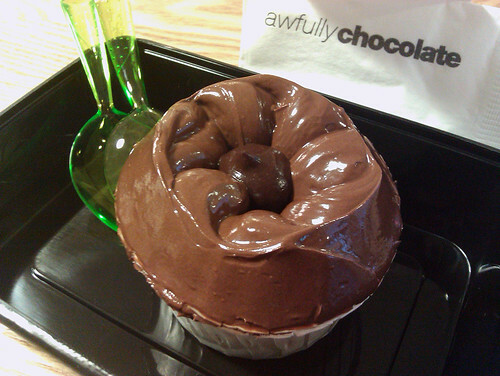 Chocolate Cupcake. Innocently simple it might sound, but sinfully delicious! If there’s anything the Devil could be an ambassador for, this has to be it! Same chocolate cake base as its white chocolate counterpart, but the chocolate icing on top is pure joy. The glob of dark chocolate fudge in the middle crowns the whole masterpiece, seals its position as epitome of cardinal sin. Devil wears Prada? Well, make sure is glaced with Awfully Chocolate! This entry was posted on September 25, 2010 by Alan (travellingfoodies). It was filed under Food and was tagged with Katong, Singapore.